This self-contained holiday home with views has cathedral ceilings, polished floors, quality furniture and appliances with modern conveniences such as ducted air-conditioning, ducted heating and terrific wood burner, dishwasher, oven, microwave, TV, DVD, music system and washing machine. The kitchen, dining and living room are all placed in a great room. There are fully covered deep verandahs around two sides of the house, with outside furniture and a gas barbecue, providing mountain views. On your way to the cottage you will drive past at least 6 wineries. Comfortable king size beds in both bedrooms of the cottage. For a two person booking we will normally provide one bedroom and one king size bed. The second bedroom can also be made up as twin beds on request. If guests want to have bed configurations that are not the default (eg 2 people will normally have one bedroom and one king bed), then it is their responsibility to let the host know. It may or may not involve a surcharge. No smoking and no pets. Linens, towels and pillows are provided. Yarra Junction is a village with a supermarket, butchers, bakeries, gift shops and several cafes situated close to many wineries. The central location provides easy access to Warburton, Healesville, Yarra Glen, Gembrook, Poweltown and Noojee for example. About an hour, or less, away for Yea, Kinglake, Mt Donna Buang and Lake Mountain. Enjoy the experience of the lavender harvest season. Learn about lavender and visit the Drying Shed with hundreds of bunches hanging from the ceiling. The Tea Rooms and Gift Shop offer lavender delicacies, scones, ice-cream and many gifts to remember your experience. The garden walks through the private homestead gardens. 1. Check in is after 3pm and checkout is by 11am. But if you want to arrive a little earlier or stay a little longer, please just ask. Quiet time after 10pm so as not to disturb our great neighbours. 2. If guests want to have bed configurations that are not the default (eg 2 people will normally have one bedroom and one king bed), then it is their responsibility to let the host know. It may or may not involve a surcharge. 3. While the property is well cleaned between every guest stay we kindly ask that you put away cleaned dishes and kitchenware, and put out rubbish (from kitchen and bathroom) to exterior bins. 4. If you are coming to the Yarra Valley to party it may be a great place to do so, unfortunately just not at our place. We have a great relationship with our neighbours and complaints of unruly and noisy behaviour that will disturb them will result in your being asked to leave. 5. We have a policy of 21+ as a minimum age requirement of anyone booking the cottage. Younger guests are welcome but need to be accompanied by parents or guardians. We are sure this would not apply to you, but only booked guests are permitted to stay overnight. 6. Many people need to have a smoke free and pet free house for their break. Please ensure that is still possible for subsequent visitors, and ourselves. 7. In order that we can continue to keep costs down, heating or cooling should be turned off when you depart, and when you are out for the day. 8. We understand accidents happen but please let us know when they do. Often these can be fixed easily especially if we know in advance of the changeover. This often means a better chance of having your full security deposit returned too. 9. Please lock both the front door and security door, when you depart, and keys must be returned to the key safe. It will be greatly inconvenient if we need to change the locks and a cost we would not wish to have to deduct from your security deposit. As a precautionary measure please keep the verandah gate closed at all times. 10. WIFI is not yet unlimited and is only sufficient for browsing and email. Please ensure there is some download left for subsequent guests. 11. We know when you arrive you will be keen to relax and enjoy your stay, but we ask that you take a few minutes to check the House Manual soon after you arrive. Because of the polished floors, please no high heels inside. I love to travel, and although I travel less these days, I do spend time dreaming up what might be my next adventure. I also love to paint (watercolours) and you will find some of those in the cottage. We spent quite a long time living in France for part of the year, where we did learn to speak French. The profile photo shows me at one of my solo exhibitions in France. The view but retained proximity to good village facilities. Quick to escape Melbourne, catch up with friends or your partner and get to know the Yarra Valley. Very large open concept living area with cathedral ceilings gives airy and expansive feel and the outside wrap around deck provides access to the view. Crisp new bathroom with shower, basin , toilet and a bonus laundry with washing machine. Several DVDs in drawer under TV. Small library of wide variety fiction and non fiction. Quite a few games, from Chess, Monopoly, Pente, Scrabble, Mah Jong and more. There is a village pool in the Yarra Centre. The house was clean to the corners & comfortable. Yarra Junction Getway what a gem,Very well presented it was just fantastic. We were very pleasantly surprised at this great house. Every detail for a great getaway has been thought of. Best 2 nights sleeps I've had away from home ever beds were so comfortable. 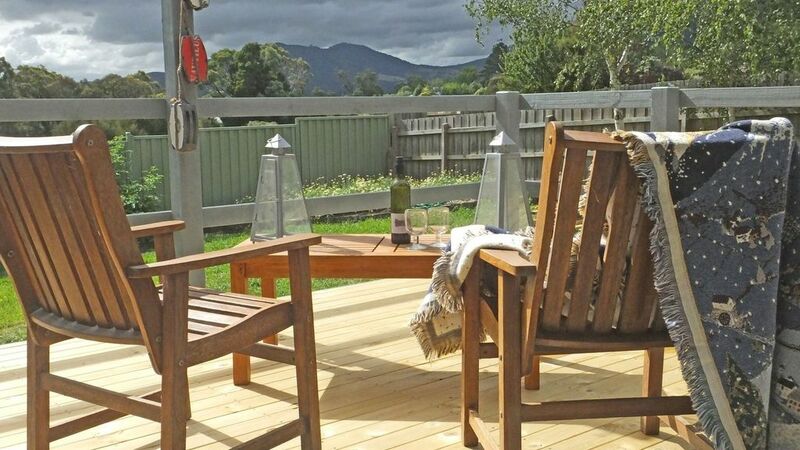 So well situated to access all of the wonderful sights and food of the Yarra Valley. The property provides a nice homey feeling. Our needs were well catered for. The home has everything you need with a well equipped kitchen and pantry, lovely large living space, a book collection to lose yourself in, games and a large TV . The beds are super comfy, the shower great, the deck tranquil and the heating and cooling fast and efficient. Overall extremely pleasant and comfortable, with responsive and helpful hosts. It sounds as though you had the quiet and peaceful time you were looking for!! After a long journey from the U.K we were pleased to find an enjoyable holiday home, where we could recover from our jet lag. Susan was a very caring host. The spacious quirky cottage was relaxing and peaceful .Kitchen was fully equipped with many little extras that we found very useful especially when travelling light. Fresh picked Rhubarb from the garden was delicious. large bed was comfy. Good signal on WiFi. We enjoyed Yarra Juctions rail trail walks meeting friendly people along the way. Thank you Susan for your hospitality and thoughtfulness. A cosy cottage style house with all the necessities. We thoroughly enjoyed our stay. The house was very clean with a well equipped kitchen and a nice newly renovated bathroom. We particularly enjoyed the fireplace and cosy ambience. An ideal place to stay for a quiet getaway.